It’s summertime and your kids are on break from school. You realize that your kids are going to be at home for a few months, and you will need to feed them breakfast, lunch, and dinner. You take your kids to the grocery store, but you only have $10 that you will need to stretch for the entire week. You buy some basics like milk, eggs, and bread, but your kids ask if they can get fruits, desserts, and veggies. You have to tell them “No. I’m sorry kids, but we can’t afford those kinds of things right now.” So they go without. For millions of families, the absence of free school meals or discounted lunches is a cause for worry. Most American schools take 10-11 weeks off during the summer. It’s supposed to be a fun time for children and families. For millions of families, however, the absence of free school meals or discounted lunches through the National School Meal Program is a cause for worry. 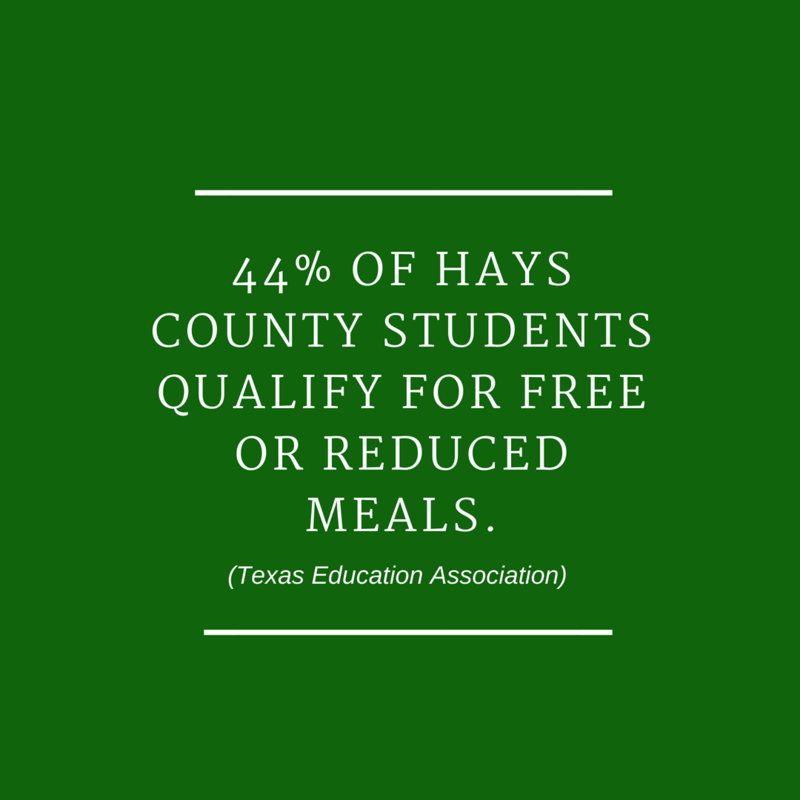 If 44% of Hays County students qualified for these meals during the 2017-18 school year, (Texas Education Association) what does that mean for our local, low-income families? What can parents do to ensure their children are still getting nutritious food when they are not in school and breakfast and lunch are not provided? While hunger can be harmful to everyone, it can be especially devastating to children because of its potential for long-term consequences. Research shows kids struggling to get enough to eat are more likely to have problems in school and in other social situations. That’s why it’s important to make sure kids have access to nutritious meals, even in the summer (Feeding America). This is just one of the 13 million children facing hunger each day. Read this article to see how hunger could be affecting your child. While hunger can be harmful to everyone, it can be especially devastating to children because of its potential for long-term consequences. Children need nutritious meals to learn, grow and thrive–even when school is out. The USDA’s Summer Food Service Program helps solve the summer hunger problem. Kids 18 and younger can continue to eat healthy at NO COST! They just need to show up at a participating meal site, and breakfast or lunch is served. Call 211. They can also help low-income individuals and families find other beneficial services. Text “FOODTX” to 877-877. Then, just text your zip code to find a site near you. Visit SummerFood.org. Meal sites from all over Texas are listed here. Who Offers FREE Meals in Hays County? San Marcos CISD also offers meals through their Purple Bus Mobile Meals Program. They will deliver meals to kids who can’t make it out to one of the meal sites. Kids must live in the San Marcos area to qualify for meal delivery. For a better look at how the Purple Bus works, watch this short clip. How Can We Help Feed Your Family? Hays County Food Bank holds 7 public food distributions each week. Households are allowed to receive food up to two times each week! Click here for more information. In collaboration with Central Texas Food Bank, we distribute food every first Tuesday and every third Thursday of the month at 8:30 a.m. at Rattler Stadium in San Marcos, Texas. Click here for more information. According to Feeding America, children facing hunger may struggle in school — and beyond. They are more likely to repeat a grade, experience developmental impairments in areas like language and motor skills, and have more social and behavioral problems. With resources like the ones listed above, there’s no reason your child has to go hungry! Remember, children and adults face hunger in every community across the country. Your neighbor, child’s classmate, or even coworker may be struggling to get enough to eat, so please share our articles through your Facebook, Instagram, and Twitter! Hunger might be closer than you think.